You're drawn to triathlon as a sport. The swim-bike-run combo looks fun. Your friends are training or already racing. You have a bike somewhere. You could use some me time, but you're not sure. Tell me, what's stopping you? 2009 is your year to taste triathlon. As a triathlete, you'll surprise yourself as you face fears and set personal bests. You'll be more confident, have more energy and smile more often. People will be drawn to that difference. Triathlon is a rewarding sport for people of all ages and abilities. I hope to break down your obstacles: time, money, fear etc. Give triathlon a chance. Don't see your excuse listed? Feel free to pick one of the 45+ excuses UW-Whitewater Basketball Player Matt Scott delivers in this powerful Nike 'No Excuses' Commercial. I think my favorite is "I bruise easily." How about you? Thanks for stopping by my blog. I look forward to reading yours as it sounds like you have lived the journey that I am beginning. I have lost about 31 pounds and am on my way to losing over 100 pounds this year. I plan on being able to run a 5k this summer at the end of my sprint tris. I plan on doing an Ironman in 2013 right before I turn 40. I'm so excited about the whole process. Thanks for the video. I already put it on my blog. I didn't realize how many excuses became part of my daily dialog until I got my coach and he let me have it. Thanks again and I look forward to getting to know you. 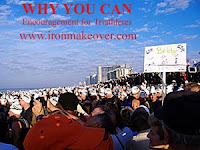 My wife send me a link to your why you can series and it has really motivated me to keep pushing toward my triathlon goals. I have used each one of those excuses at some point and at times it is hard to get past some of them. Thanks for the insight and motivation. LOL at "I got a case of the Tuesdays". Amazing ad! Your blog is great. I just saw you were an Active.com mod. That's awesome. I'm "Active Sara". I work over there. Just put two and two together. Keep up the good work. Why You Can - #5 - "I'm not an athlete."